**HOT!! 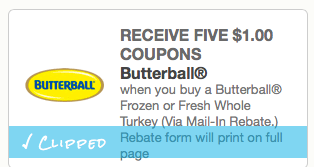 ** Butterball turkey mail in rebate! Buy a Butterball Fresh or Frozen Turkey, print off the mail in rebate above or click the link below (it will take you straight to the rebate!). Fill out the form and mail in!